Recording Video: VHS to KDVD?? Hello, I wanted to convert my old VHS's tapes to DVD's or KDvd's, but I don't know how. 1) How can I transfer my VHS's to the computer? I've heard of pc cards, Digitatl VCR's (with a usb connection), and adapters. 2) Which is gives better audio/video quality? 3) Which is the cheapest? 4) Where can I buy them? This way, you can capture at a very high bitrate (~12Mbps), and then transcode to KVCD/KDVD. I also capture at 12Mbps with Pvr-250 and use rewritable DVD. Which template are you using for KDVD? Hi Kwag, first of all thanks for the fast response. I wanted to let you know that the main thing why I want to transfer to my pc is my son's first memories. 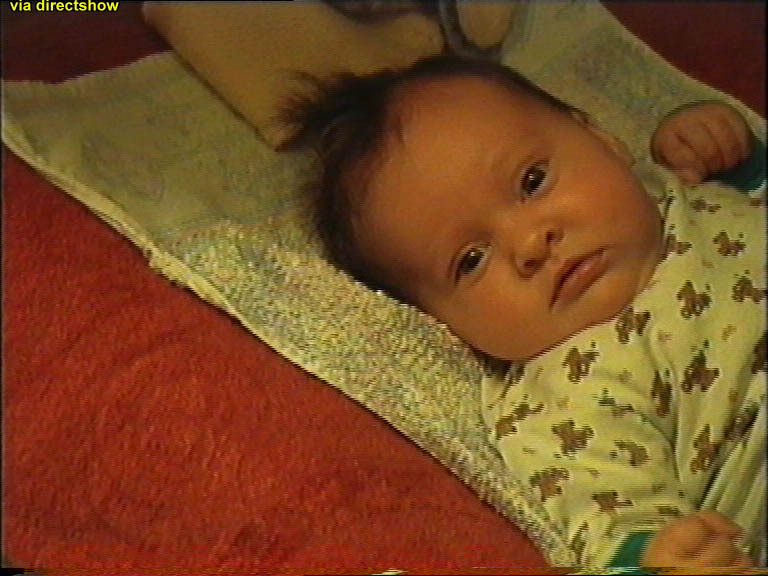 I tried to do this from my Hi8 camcorder using Roxio Easy Media Creator 7, and everything work fine. I noticed that the resolution was 320X240 and it was in avi format. 1) Is there any way to make the resolution higher, by either using another program or transferring the video some other way? 2) Is transferring the video as mpeg better, if so how can I do this? I also found out about a Dazzle Digital Video Creator that it has a chip that converts video to DVD quality. 3) Would the Dazzle be a better choice than the Hauppage Win TV-PVR 250, why or why not? I've used my PVR-250 very actively since I bought it last year and it's a very good card for capturing. You should definitely consider buying one. However, I don't like the filtering it does by default so I've disabled them all (I use WinTVCap which uses an ini file for settings) and do all the filtering in the avs script. Hello, you guys say that the Pvr-250 can capture at 12Mbps. 1) What is the resolution at 12Mbps? 2) Can you really tell the difference between 8Mbit/sec, and 12Mbit/sec? 3) Is there a cheaper card that does about the same that the Pvr-250 can do? The resolution can be basically any of the VCD, half-D1, SVCD or DVD resolutions. The difference between 12Mbit/s and 8Mbit/s can probably be seen during a high motion scene. The datarate is adjustable so you can choose just about anything between 0-12Mbit/s, VBR can also be used. Not with onboard mpeg2 hardware encoder capabilities, as thats the goal from that card. At this time, I don't think so. capturing at 12Mbit/s,I guess this is capturing "directly" to MPEG2??? there I have range from 500 to 6000 kbytes/sec. (This card don't capture to mpeg). this give a filesize app. 10GB pr. hour. including PCM audio. The encoded video looks great. or is it just waste of HD space?? I'd go for max if I had the diskspace to do it And yes, PVR-250 captures directly to MPEG-2. with KDVD matrix?,or are they "designed" for the matrix? Well, the DC Series do have an excellent mjpeg hardware encoder on board as they where/are sold as semi professional capture cards. 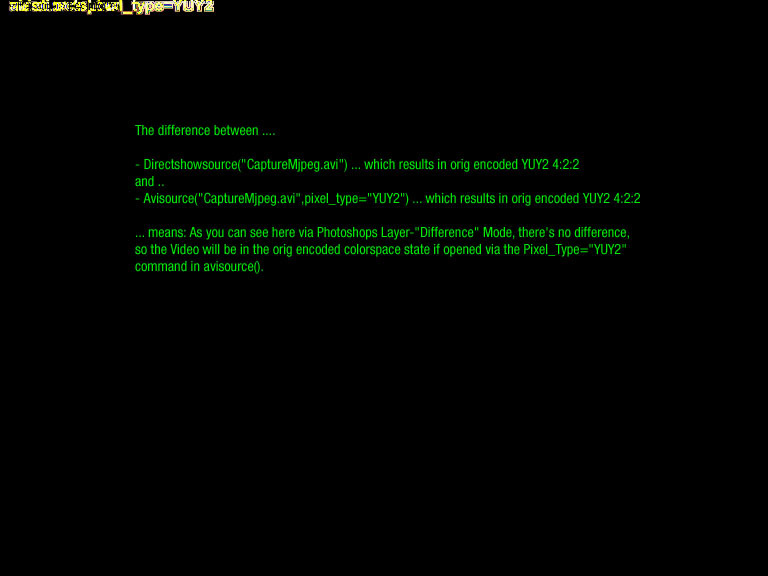 Keep in mind that mjpeg is like mpeg but in YUY2 AND like "I" Frame only while CBR capturing. And all these are "I" Frame only as thats needed for frame acurate cutting and also CBR is used. Betacam SX already is quite lossy as "I" Frame only would need much more bitrate. So Betacam IMX at 50Mbit/s is a mega HQ Studio way of digitizing. Now your DC10 (or mine DC30) are able to capture at 6000/kbytes per second using a very good Zoran/Philips chip. So the VERY big potential of that card is just by 20% used if using for digitizing "TV Sheep-crap"
The only disadvantage is that this card doesnt got component Inputs like the mega expansive Targa system (in the past). But s-video connection (means Y/C separated) at least is a very good quality mode/connection. So this card can even be used to digitize streams provided by a Betacam SP Device and that was the standard some years ago in broadcasting editing services. See the point? Thats why you should everytime "smile" when looking at this card. A friend of mine (from whom I got my DC30) used that one on a MAC for preparing/cutting video jobs to give them to the WDR afterwards (West German Broadcasting Station). BUT! 3300kbytes/s when capturing 768x576 is at the limit! Why? Cause even if TV Signal is crap (in relation) and even its less detailed - on the other hand its much more complex cause of uneasy components like noise! And if you would inspect your stream very carefully at 200%-400% Zoom in Vdub you already can see some artifacts, cause mjpeg needs much more bitrate then mpeg2 when using B and P Frames. And thats the goal from mjpeg as its like I frame only, means now extra compression-lossy-routines given like predicted and Bidirectional frame algorhythms (P / B). Give it room to breath and an excellent signal as input and you can see the difference. BTW: We talked at gleitz forum about that Picvideo3 YV12 issue! It seems that avisource() from avisynth 2.5x on uses as default a request of a YV12 stream. 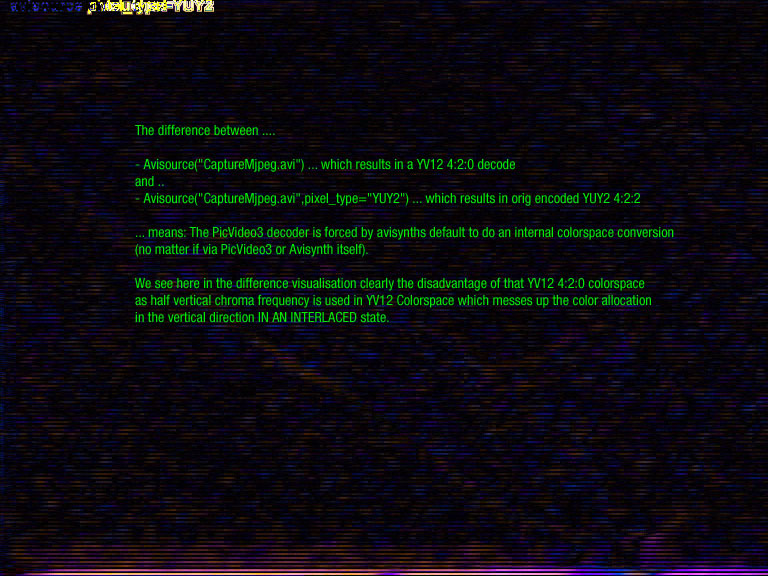 And if the codec is able to provide that, then the picvideo3 internally changes the colorpspace to YV12. Now that Pixel_Type="YUY2" workout "could" be the solution, ... IF Its proofed that picvideo3 REALLY doesnt change the colorspace by that! But if he again re converts the conversion to YUY2 again, that would be a mess! Thanks for the info., Inc. Seems like the card is ok then. to see the difference from 3300kbytes. outdated(made in 199 ,and I don't use it anymore. I replaced with a mini-DV camera. (Panasonic NV-GS 50). So I use S-Video input when capturing from the old camera. stuff is crap more or less,and VHS is a poor format. and they report YUY2 for Dirshow() and YV12 for AviSource(). the colors are clearer/stronger than when I use AviSource(). But that can be a vfw / wdm issue as you said earlier. Ill make a try with "Pixel_Type="YUY2"" . I think I got PICv 2 somewhere on my HD so ill make a test. They don't fit because they don't have the same colorspace. You'll have to open each part on its own (a, b and c) and take a screenshot of the same frame, try to take it from a scene with a lot of red for example. I recommend using PNG since it's a lossless format. hey don't fit because they don't have the same colorspace. I left out the stackvertical stuff and used a,b,c script lines one by one. I over-layered Vikings pics in Photoshop and used the "Difference" Mode in the Layer view. SO.... If Pixel_Type="YUY2" is used in avsisource() it seems that the picvideo3 decoder is FORCED to provide the original encoded YUY2 state. If just Avisource() is used without flags, then Avisource() forces the Picvideo3 decoder to provide a to YV12 colorspace converted stream.